Global Youth Day Conference (March 23): Youth Rising - From Inspiration to Action! 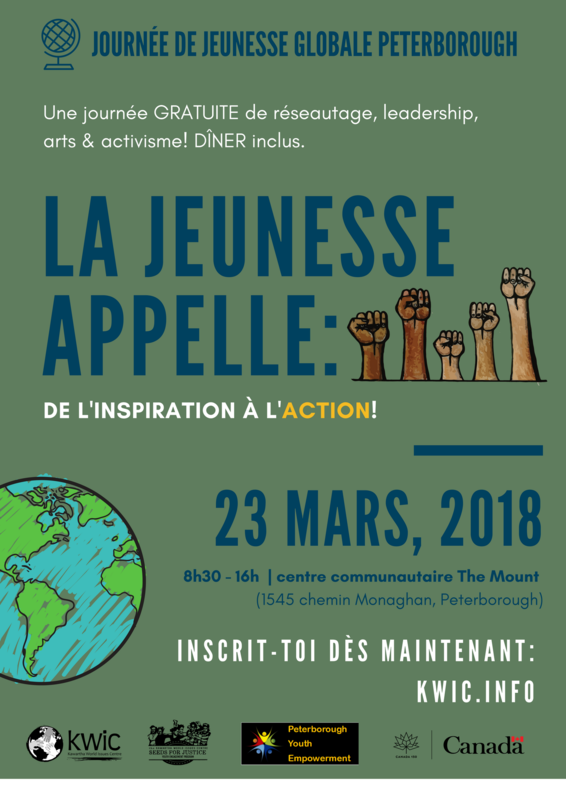 Global Youth Day (GYD) is an annual free conference put on by youth for youth in the spring; bringing together 75+ youth in Nogojiwanong (Peterborough, ON) to participate in social and environmental justice education and leadership training with a global lens. The conference will be held at the Mount Community Centre on 1545 Monaghan Rd, Peterborough on Friday March 23, 2018. The theme this year is "Youth Rising: From Inspiration to Action!" Come learn about youth leadership, find your passion and creativity and network with your peers and community organizations! The conference is FREE thanks to funding by the Government of Canada. View the complete CONFERENCE PROGRAM here, including workshop descriptions and keynote bio. We look forward to meeting you and learning alongside you at the 13th annual Global Youth Day! Please note: the REGISTRATION DEADLINE for this year’s GYD is Friday March 16th, 2018. After this date we can not guarantee your spot at the conference. Kawartha World Issues Centre (KWIC) is a charitable global education and resource centre which promotes understanding and dialogue of world issues to enable people to engage in positive social and environmental change. 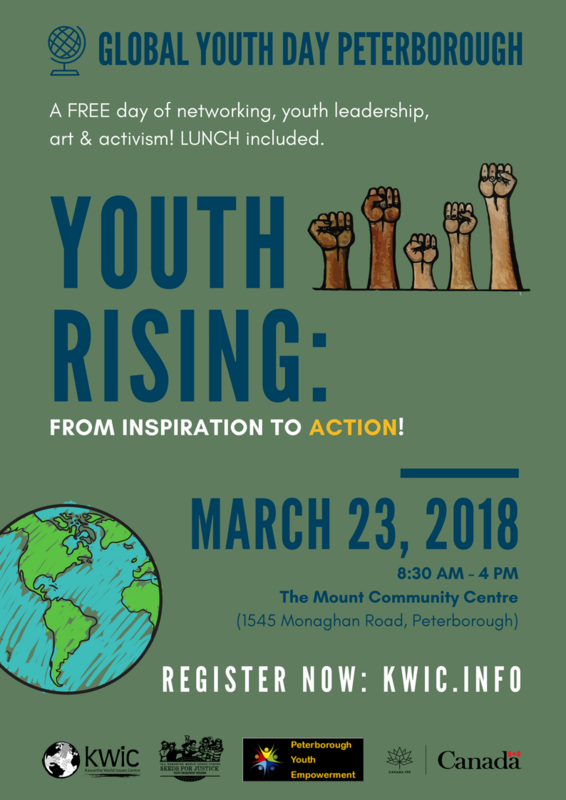 Seeds for Justice is a youth-driven initiative hosted under the Kawartha World Issues Centre which includes the Facilitators Collective, Global Youth Day and our overall youth programming. As part of Seeds for Justice, our Facilitators Collective develops and deliver social and environmental justice-themed workshops to youth in Peterborough and the surrounding areas. Our peer-to-peer model encourages dialogue and an understanding of both local and global issues while inspiring hope and change. The Facilitators Collective’s workshops are fun and interactive and operate using a popular education and anti-oppression framework, as we are committed to making learning and education an accessible and safe space for all! Peterborough Youth Empowerment is an initiative that launched in August 2017 with the goal of encouraging youth advocacy and increasing awareness of youth opportunities in our local community. They accomplish this through social media advertising and seasonal volunteer fairs. The team consists of twelve high school students from across the city.